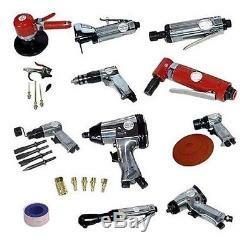 31 Pcs Automotive Shop Pneumatic Air Tool Set. AIR TOOLS MODELS, COLORS OR STYLE MAY VARY. 1/4 Angle Head Air Die Grinder HD. Specifications: Feed Speed:------------19000 rpm Operation Pressure:----90 psi Minimum Hose Size------1/4" Air Consumption--------3 cfm Air Inlet--------------1/4" Length-----------------5-3/4. 1/4 Air Medium Die Grinder. Specifications: Free Speed:------------22000 rpm Operation Pressure:----90 psi Minimum Hose Size------3/8" Air Consumption--------4 cfm Air Inlet--------------1/4" Length-----------------6-7/8. Specifications: Blows Per Minute:------4500 bpm Piston Stroke:---------1-5/8" Operation Pressure-----90 psi Minimum Hose Size------3/8" Air Consumption--------2 cfm Air Inlet--------------1/4" Length-----------------6" Contents: 4 Pcs Air Chisel Set 1 Pc Spring. 5 Air High Speed Sander. Specifications: Free Speed:------------1800 rpm Operation Pressure:----90 psi Minimum Hose Size------3/8" Air Consumption--------4 cfm Air Inlet--------------1/4" Length-----------------5-3/4. Specifications: Free Speed:------------10000 rpm Pad Size:--------------6" Operation Pressure:----90 psi Minimum Hose Size------3/8" Air Consumption--------6 cfm Air Inlet--------------1/4" Length-----------------4-1/8". Specifications: Free Speed:------------150 rpm Max Torque:------------45 ft/lb Operation Pressure:----90 psi Minimum Hose Size------3/8" Air Consumption--------4cfm Air Inlet--------------1/4" Length-----------------10-1/2. Specifications: Free Speed:------------22000 rpm Operation Pressure:----90 psi Minimum Hose Size------3/8" Air Consumption--------4 cfm Length-----------------7-5/8". Specifications: Free Speed:------------9000 rpm Max Torque:------------75 ft/lb Operation Pressure:----90 psi Minimum Hose Size------3/8" Air Consumption--------3 cfm Air Inlet--------------1/4". Specifications: Free Speed:------------7000 rpm Max Torque:------------220 ft/lb Operation Pressure:----90 psi Minimum Hose Size------3/8" Air Consumption--------4 cfm Air Inlet--------------1/4". Specifications: Free Speed:------------2200 rpm Operation Pressure:----90 psi Minimum Hose Size------3/8" Air Consumption--------4 cfm Air Inlet--------------1/4" Length-----------------7-7/8. 5 Pcs Air Blow Gun Kit. Specifications: Maximun Pressure: 125 psi Minimum Hose Size------1/4 1 Pc Rubber Tip 1 pc Metal Tip 3 Pcs Needle Tips. 3 x 5 Pcs Quick Couplers - Brass. Solid Brass Contents: 1 Pc 1/4" NPT Female Thread Quick Coupler 4 Pcs 1/4" NPT Thread Quick Fittings. 1/2 Inch x 520 Inch Flexible. Remember to please include your zip code (or country, if outside of the US). We are more than happy to hear from our customers. We promise will answer all of your questions as quickly and accurately as we can. Welcome To Our Discount Tools Store! We are California based company An established business for over 15 years, as a direct wholesaler and distributor, we supply to our customers with the best quality tools, for less. We are Continuously providing our customers with the latest, hottest items. Our warehouse includes over 20,000 square feet of a wide range and variety of tools: Automotive, shop equipment, Woodworking, contractors tools, power tools, hand tools, acoustic guitar, electric tools, drills, grinders, engine hoist, wood working tools, hardware, air tool, compressor, screwdrivers, router, automotive tools, cordless tools, plumbing tools, garden tools, etc. DCMM is committed to excellent service towards their customers to any location around the world. Additionally, please let us know immediately if you need your item in a quick manner. Please understand this risk before purchasing. The item "31 Pc Automotive Shop Pneumatic Steel Air Tool Drill Wrench Ratchet Bit Set Kit" is in sale since Wednesday, October 3, 2012. This item is in the category "Business & Industrial\Light Equipment & Tools\Air Tools\Other Air Tools". The seller is "dcmmgeneralstore-97" and is located in Pasadena, California.